Add a little zest to your next culinary creation with herbs picked fresh from your own garden. Or create a naturally delicious side dish of sun ripened vegetables that you have grown yourself. There is nothing more gratifying than enjoying the naturally fresh flavor of homegrown cooking. The SAFEST way to eat, GROW YOUR OWN ! 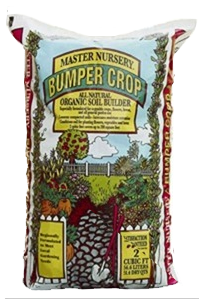 We recommend using Bumper Crop Organic Soil for all of your vegetable and herb growing. Bumper Crop Organic Soil is supercharged with mycorrhizae, worm castings, kelp meal and dehydrated poultry manure. Use it to amend your existing garden soil or fill containers with this great soil. We also stock Mushroom Manure Compost in bags and bulk to add much needed nutrients to your flower and vegetable garden soil. 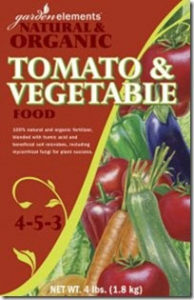 We use Garden Elements Tomato & Vegetable Organic Fertilizer in our gardens; so should you ! As you plan your garden for this year, keep in mind that using the same layout year after year is not going to result in the best yield for your crops. Certain plants need certain nutrients from the soil to thrive and once depleted, they will not grow as effectively. Rotating crops allows the soil to remain nutrient rich. Tomatoes, peppers, eggplant — they like lots of nitrogen and compost, so good soil preparation before planting is essential. Peas, beans, parsley, dill, coriander— they actually thrive in nutrient poor soil, and in fact, add nitrogen to the soil, resulting in a natural way to fix poor soil. Cabbage, broccoli, cauliflower, brussel sprouts, collards, kohlrabi, squash, pumpkins, melons, cucumbers — this area will need lots of space so you might want to use a trellis for the squash and cucumbers to make space for the other plants. These plants are heavy feeders so amend the soil with compost and nitrogen before planting. Corn — this plant needs LOTS of space because it pollinates via wind. Corn is also a big user of water and food so amend the soil before planting. Rotate these four areas each year, moving number 1 to 2, 2 to 3, 3 to 4 and 4 to 1, etc. This will allow for the best success in your gardening experience. We offer a large selection of ALL types of vegetables and herbs; follow these links to the most popular types or come into the store to experience the sights and smells yourself !